I get it. You have probably just dropped your child (children) off at school for their first day back and you find yourself, all of a sudden, in silence. After two months of summer holidays, things are now back to normal. 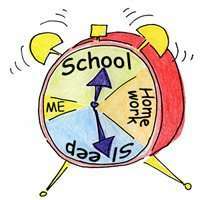 of the constant pressure of always having timelines and reminding your kids to do things all the time. Two months have gone by and the last two weeks of summer holiday have probably felt like an eternity because most summer camp programs came to an end and the kids were at home with you driving you crazy with constant requests to buy stuff for school or to do things because they were bored. Now…30 minutes after the 9 o'clock school bell rang and you said goodbye to your kids for their first day of school, you are returning to the normal. If you are back at the office…the silence of fingers on keyboards and muted voices on telephone calls with clients/customers is a beautiful thing. The car ride (in silence….other than the radio blaring or the horn honking because of some moron doing something stupid in front of you) is a beautiful thing. The subway/bus ride crammed with people all listening to their Ipods, is a beautiful thing. For the next 8-10 hours…the only contact you will have with your children will be in your thoughts. You will be thinking about how they are settling into their new class. What they think of their new teacher? Did they each their lunch? Are they making any new friends….are their old friends still their friends? Did the put on their jacket because it was a chilly start to the school year? But these are just passing thoughts in your mind. Beyond that, you will be amongst your own kind…again. You will be in a world of adults…having civilized adult conversations with people your own age. Yes, some of these conversations might be stressful (altercations with co-workers or bosses) or rude people at the grocery store or obnoxious people budding in line at Starbucks. But you are in your own element because these people are grown ups. Best part…there will be no interruptions by little voices asking you to get them a drink, to braid their hair or dress up their doll. emergency and they have to call, I will not see or hear them until at least 3:30 (unless I am at a business meeting). whining, no fighting, no crying.